Please join us on May 2nd for Valley Gives Day! Valley Gives is an opportunity to improve the quality of life in the Pioneer Valley. We are all part of each other’s future. The more people who participate on May 2, the stronger our region can be. When we can join forces as donors, organizations and sponsors we can meet our region’s needs and support its hopes and dreams. Our mission is to enrich greater Northampton’s quality of life by offering first class performing arts and film presentations in an historic theater of national significance. We seek the use of the venue for social, educational, and professional efforts, as well as a broad and diverse audience through our programming and outreach efforts. When you donate to the Academy on Valley Gives Day, you will help to keep our historical and cultural institution alive. 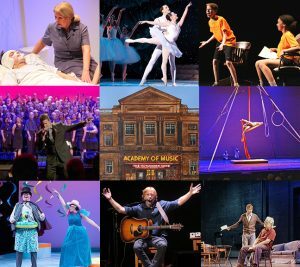 This year, we will present our 7th annual Season Series, host community groups as they celebrate anniversaries and hold benefits, and express our community’s social values through the arts on the Academy stage. In order to build and encourage our next generation of theatergoers and art-lovers, and to enrich the lives of Valley youth, the Academy will also continue to offer educational programs for children ages 7-14. Your donation supports the continued operation of the Academy of Music as a beloved cultural institution, valuable resource for community arts groups, and economic driver in Hampshire County. For more information, please contact Emily Curro, Development Manager, at 413.584.9032 x101 or visit aomtheatre.com.